Ovingdean Hall Foundation has grown out of Ovingdean Hall School for Deaf Children, retaining the school’s charitable objects and charity number. Very sadly, the school closed in 2010 as a result of declining pupil numbers. Many former staff and students have stayed in touch and have signed up for our Newsletter. Please let us know if you would like to receive our Newsletter. In 2013, we contributed toward Ovingdean Reunion Association’s event which was attended by over 200 former staff and students. Our school for deaf children was based at Ovingdean Hall near Brighton (pictured left) from 1948 until 2010. During that time, the school’s dedicated teams of teachers and carers educated generations of deaf children, many of whom have stayed in contact with each other and the Foundation. The school’s history goes back even further: Brighton Institute for the Deaf opened in Kemp Town, Brighton in 1841. The first headmaster William Sleight (1819-1912) led the school for 72 years. The school’s original home was 12 Egremont Place, Brighton, before moving to 127-132 Eastern Road, Brighton in 1848. During World War II the school was evacuated away from the coast to Wivelsfield Green Farm in Sussex. 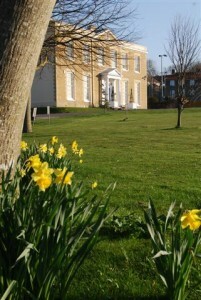 In 1948, the school moved to Ovingdean Hall, a Georgian manor house and former prep school which, during the War, had served as a base for Canadian service-men. The parking station for the tank is still visible near the lodge house. In 2010, Ovingdean Hall was sold to an international school, and the monies raised used to set up a Foundation for deaf children. Our collection of log-books, some going back to 1841, are held in the archives of Sussex Records Office. Learn more about the history of Ovingdean Hall School.